An Eliminator Vortex may, for some, sound like the main feature of a futuristic science fiction story. But there is nothing fictional about the latest major innovation of Sentinel Performance Solutions. And we were given the challenge to ensure visitors knew all about it at the Installer 2018 show. We did so in a VERY BIG way. 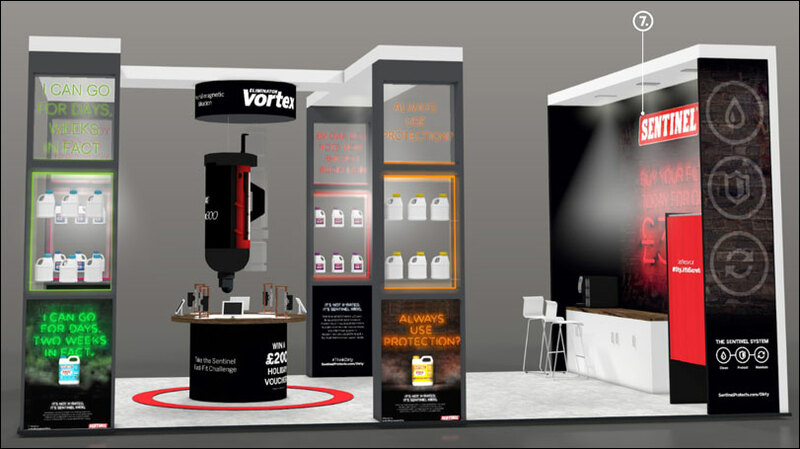 In fact, the replica Sentinel Eliminator Vortex300 Filter that was presented on their exhibition display stand was nearly 10 times larger than the actual product and created a huge impact with visitors. The story began some six months prior to the national heating and plumbing show taking place at Ricoh Arena, in Coventry. 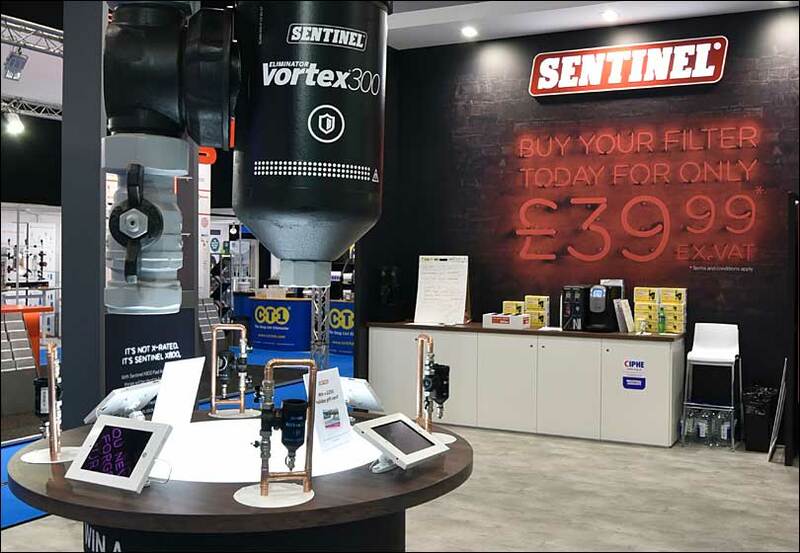 Sentinel, who have been meeting customer demand for superior heating system protection products for more than 30 years, approached us to discuss their plans to exhibit at the event. Differentiate them from the competition. Make a strong impact with show visitors. Reflect its marketing campaign themes. 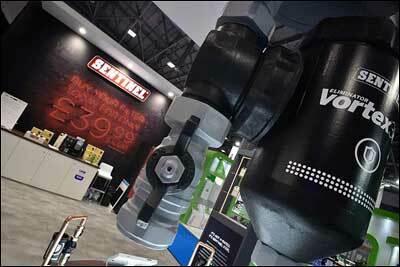 Highlight their latest major innovation, the new Sentinel Eliminator Vortex300 Filter. Creative direction and layout concepts. Daniel said: “If I’m going to work with a premium partner, I’m going to expect a premium service and that is exactly what I got. I could have let an agency do the design and simply asked someone to build it but that wasn’t the service that I wanted. As part of our delivery of this phase of the project, we conducted comprehensive competitor research, immersed ourselves in the Sentinel brand and products, and assessed a variety of styles and possible materials. We then presented our findings including a set of bespoke line drawings. The focal point of our design concept was the giant replica of the Sentinel Eliminator Vortex300. 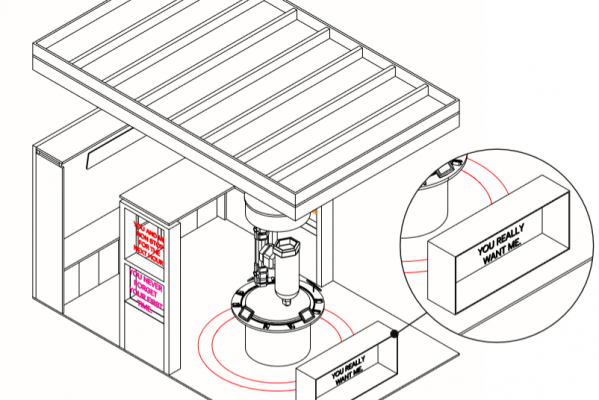 Following the successful review of our concepts, we were invited to progress the full project of detailed design, technical build, and fulfilment. 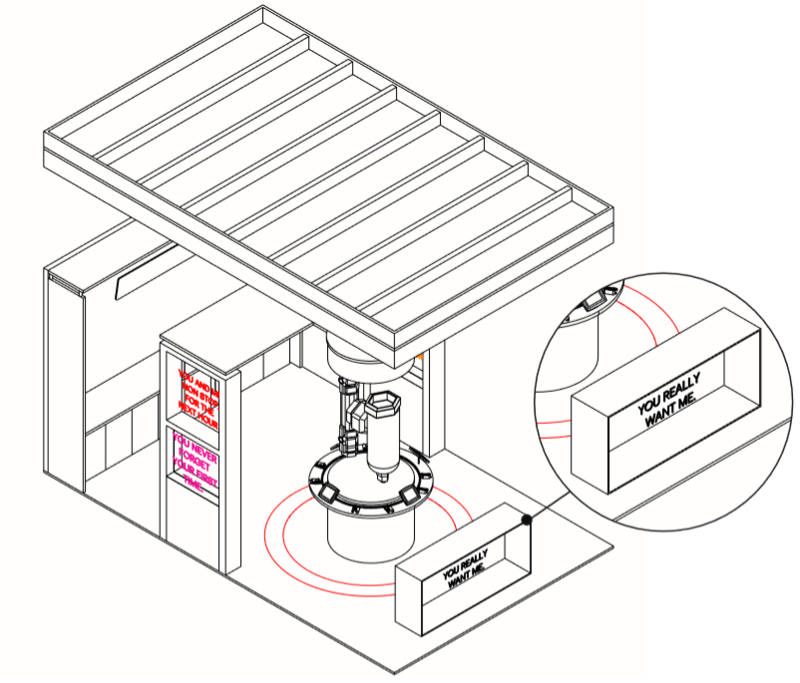 A central hub table where customers could examine and handle the product. Broken-up roof sections to allow light in from the venue. 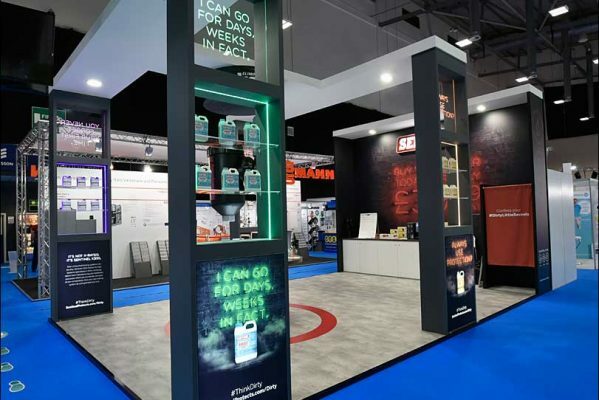 LED signage in columns conveying marketing messaging, with the relevant solution bottle underneath. 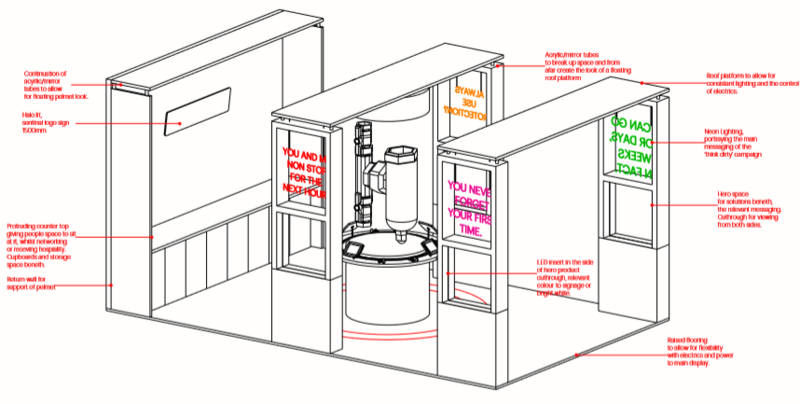 Cut-out sections in the columns to allow customers to see onto the stand from all viewpoints. Acrylic shelving to give the appearance of floating products. Stone texture flooring providing brightness and clear space. And the design was rounded off with a large rear area for storage cupboards, hospitality, and a space to network. When built and installed, the actual exhibition display stand perfectly reflected our design, including featured thematic copper piping on the central table and a lightbox, allowing it to illuminate the Eliminator model. 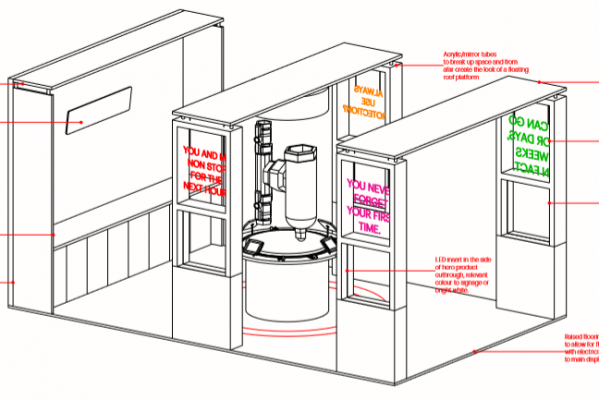 In addition, actual-size Sentinel Eliminators and touch screens were used, allowing visitors to browse the product, its specifications, and participate in an interactive competition to see who could change a filter in the fastest time. Daniel added: “The whole project ran very smoothly and any minor issues were dealt with. Leading up to the show, the team at Merit kept me up to date but they essentially handled everything. 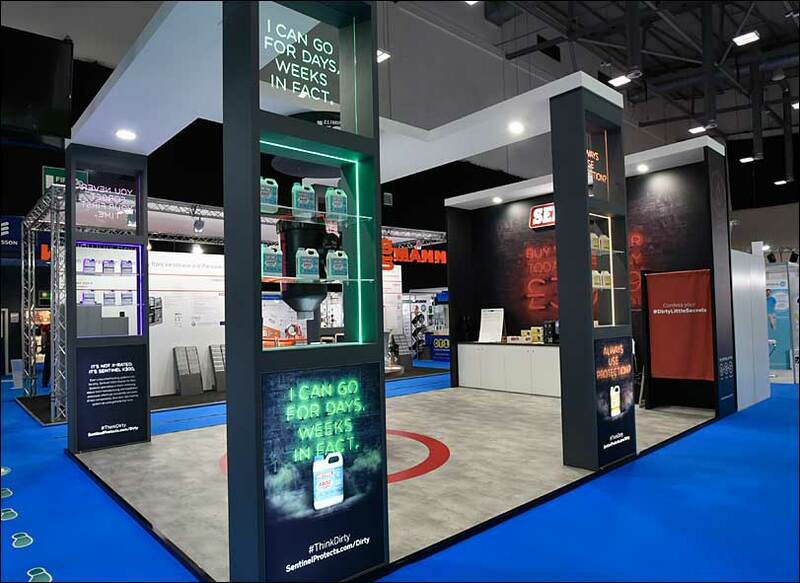 The Installer 2018 event proved to be a great success for Sentinel and they are now looking forward to gaining even stronger value from the exhibition stand by reusing it in full or in part at Screwfix LIVE 2018 and next year’s Installer show. “The pride and care the team took with our project was demonstrated when the designer and account team visited the stand during the show.